How much do you know about the Hong Kong offshore tax regime? Do you know Hong Kong has one of the simplest and tax friendly regimes in the world? In fact, what makes Hong Kong a sought after business center is its simple tax regime and territorial base of taxation. In Hong Kong, you only need to pay the tax rate of about 16.5% on a trade, profession, or business that is carried out in Hong Kong. What’s more, Hong Kong is also positioned as the topmost financial hub and one of the most competitive economies in the Asia-Pacific region. Before you start your business here, there are some things to know about the offshore tax regime. As the saying goes, “Prevention is the best cure”. Better to know beforehand of the different aspects of the tax regime in Hong Kong to avoid any troubles later on with the IRD (Inland Revenue Department). Are you ready to know about Hong Kong Offshore Tax Regime? Let’s start with the questionnaires! #1 Question- Is my profit assessable to income tax in Hong Kong? This is the first and foremost question that entrepreneurs must face while setting up a business entity in Hong Kong. Every business owner wants to keep their profits in their pocket as much as they can. And in the competitive business world, owners not only set up a business, but also strive to attain maximum profits. So, let us give you the answer to your first question. Well, Hong has a territorial-based tax regime. In short, the profits which are only derived in Hong Kong are liable to profits tax. 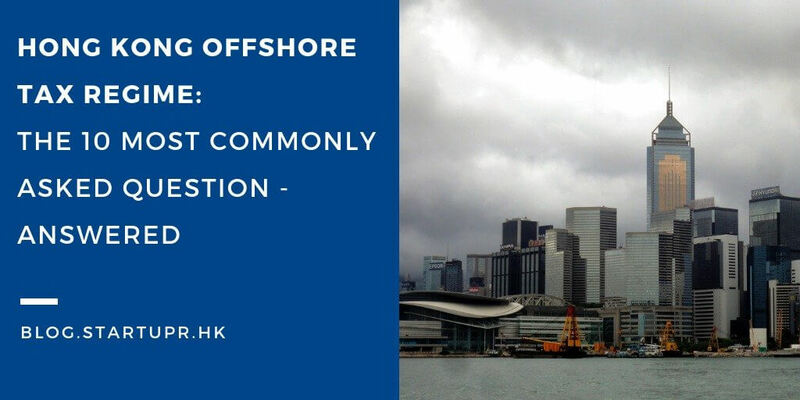 Therefore, the profits derived by a Hong Kong limited company (Hong Kong company) outside of Hong Kong may be treated as offshore-sourced income and thus exempted from Hong Kong taxation. No worry! Here are some examples of various business incomes prepared by the IRD to get a better idea. Let’s suppose you are operating a manufacturing business in Hong Kong. You want to broaden the boundaries of your business entity and step into a contract of processing or assembly arrangement with a Mainland China entity to operate the business by providing the raw materials, technical know-how, management, training and supervision for the Mainland China labor and much more. In that case, you might be able to claim 50% of the manufacturing profits exemption of taxes in Hong Kong. For this kind of income, your Hong Kong company has to negotiate and conclude the terms of the purchase and sale contracts with the suppliers and customers outside of Hong Kong and also carries out the operations outside Hong Kong. If you are conducting your business like this, then you can also claim the trading profits so derived are non-taxable in Hong Kong. When your company operates services somewhat outside of Hong Kong and partly in Hong Kong, then it may be possible to claim a part of the service income to be not taxable. #2 Question- How to start the process for profit tax exemption? This method requires you to write to the IRD describing your intended operation and request for “Advance Ruling” before you begin the process in the Hong Kong company. This request must be for a factual case in regards to your company, and not hypothetical. The Inland Revenue Department would issue the first annual filing request (ie. Profit Tax form) after 18 months from the company incorporation date. Therefore, business owners have about three months after this in order to file their Audit, where the period to cover is from the incorporation date to the chosen financial year end. When you file the Audit and PTR, you will also apply for the profit tax exemption for the company. We know you must be thinking about the documentation to support the claim. The next question is all about the required documents. #3 Question- Do I have all the required documents to apply for tax exemption? When your Hong Kong company submits the annual tax return for the first time, make sure that you are applying for the Hong Kong tax exemption and that you have derived your business income outside the boundaries of Hong Kong. These documents are the most important documents that you need to prepare. However, sometimes The IRD may also request companies to provide additional information and documents in order to support the claim. #4 Question- How The IRD examines my offshore-sourced income tax exemption claim? As stated earlier, the IRD can request you to submit additional information to track all the details of your company. They will examine each case of offshore-sourced income tax exemption claim and decide whether your company is liable for tax exemption or not. The director(s) stay less than 60 days in Hong Kong in a tax year. Proof of profits not derived from Hong Kong with sufficient proofs of transactions which give rise to such profits is provided. Therefore, if you are seeking offshore tax exemption in Hong Kong, then it is strongly advisable to prepare copies of EVERYTHING that is related to your business operation for the test. Frankly speaking, the IRD may call upon many different types of information and documents, so its best to be sure you have evidence to back your claim. #5 Question- What is a Tax Query Letter? This is the official letter requested by the IRD for the profit exemption of your business entity. With this letter, the IRD decides whether you are able to claim for your offshore activities and profits exemption for the company. Consequently, this letter plays an important part for planning the business operations in Hong Kong. Before submitting this letter, it’s essential for you to get every minute detail of your company updated and correct! In other words, this letter normally outlines your company’s activities during a given period and then The IRD reviews this letter. #6 Question- What are some of the sample questions IRD asks me in their Tax Query Letter? Worrying about the questions that IRD can ask you in their letter? In respect of the services, the invoice/debit notes issued by the company to the payers. Whether the sales were on an indent basis or inventories were held for filling up the order. In the latter case, advise the place where the inventory was kept. Whether any distribution agreement or other forms of the master agreement was entered into with any of the suppliers. These are some of the sample questions that we have encountered for the tax query letter. Do proper research work and figure out the best answers for these questions so that you can conduct your business entity legally! #7 Question- What happens if the IRD accepts my letter? The answer to this question is pretty straightforward. When the IRD accepts your letter, then your company has successfully been granted the profits exemption, and will normally have this offshore status for 4-5 years. Typically the IRD will not send another Tax Query Letter questioning the business activities for the company. Even though this length is up to the discretion of the IRD, in several cases, the status may be shorter or longer based on the business activities and nature of each company. #8 Question- What happens if there is incorrect information in the tax query letter? This is a crucial question asked by several business owners while operating their business in Hong Kong. After the IRD issues the Tax Query Letter, companies have normally 1 to 2 months to prepare all the required documents and complete all the questions. If you somehow provide details or evidence in your response letter which is unclear, the IRD may issue a follow up letter to clarify your position. This does not automatically mean they will reject your claim, but they will seek to review all the relevant facts before they make a final judgement for the company’s activities. If in the end they found that the company’s activities did occur in Hong Kong, they may assess your total profits and taxable and issue a tax demand note for the total amount of taxes to be paid. #9 Question – Can I answer the letter by myself? As the owner of the company, you can review the letter, collected the relevant documents and draft the answers to the questions. Depending on the complexity of the questions asked, you may judge how comfortable you feel in replying to the Tax Query letter to the IRD. Note that if evidence or information which classifies the business activities as taxable in Hong Kong, then in the worst case full assessment of profits as taxable under the Hong Kong laws and regulations. #10 Question- Is it better to just pay tax in Hong Kong? As a matter of fact, Hong Kong is known as one of the freest economies in the world with a low tax jurisdiction, and claiming offshore-sourced income tax exemption may act as a double-edged sword. This means that even though you pay taxes in Hong Kong for your companies activities at 16.5% (8.25% for profits under HKD 2 million), you may hedge your risk of these activities being taxed under another jurisdiction, as you have already paid taxes on these to the Hong Kong IRD. In the case where you choose to claim offshore tax exemption, then these offshore activities would be under the jurisdiction of another country, which may have a higher tax rate than that of Hong Kong. As every case is different for each company, weigh the cost and benefits of your business activities before making important decisions for your company. By now, you must have a better understanding about the Hong Kong offshore tax exemption process. So, if your company satisfies all the requirements and do their business outside of Hong Kong , then you may apply for the profits tax exemption in Hong Kong when filing your annual profits tax return. Look no further than Startupr. We can assist you with your questions in regards to the Hong Kong tax regime and any offshore tax claims for your company. Contact us today!